This clean CV template with its cute icons features a bold header, sections with attractive dividers, stylish bullet points and lots more attractive features for an overall highly professional finish. It is completed with sample information for a secretary but would be very suitable for most roles and can be easily customised to meet your template needs. Free Secretary Word CV template (2019)	Overall rating:	5	out of 5 based on 3	reviews. 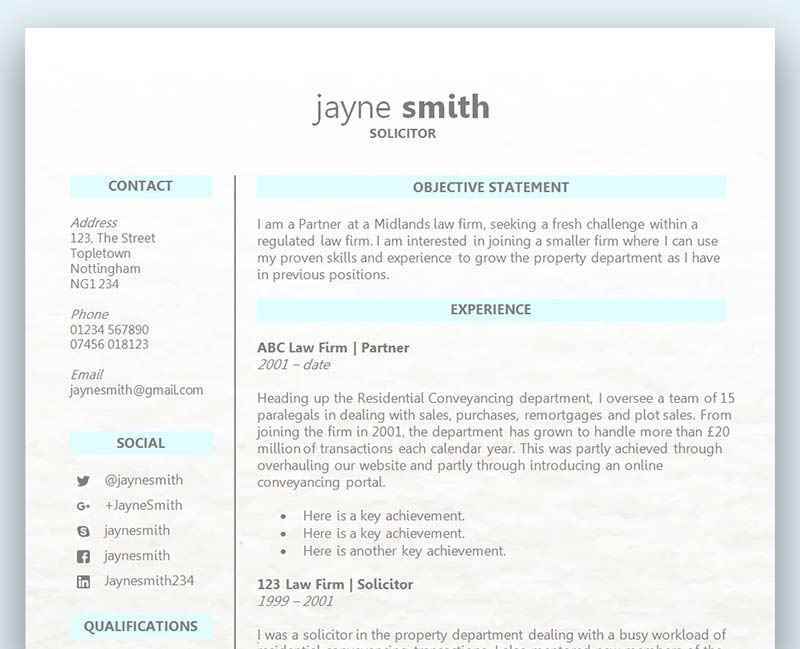 This stylish CV format uses a number of free fonts - see below for details. We recommend you install these fonts before you open up the template and start editing, for best results. Having a slight edge over your competition is crucial when it comes to writing a CV, and if you want to get to the interview stage you need to create a CV that outperforms the rest. The obvious answer to this would be – the right skills, qualifications and experience. Those three are exactly what any company would be looking for on a CV, but there is also another very important aspect that an employer wants to know when reviewing your application. The hiring manager wants to know how you performed in your previous roles so they can get a better understanding of how you will do so in theirs. Most of the CVs you’ll be up against will just list all of the previous daily tasks and responsibilities without any indication of what they achieved and how they performed. How can I improve my employment history section? Rather than just listing your daily tasks you need to also consider how you can showcase any outstanding performances and achievements. One of the best ways to do this is to first of all consider what the new employer would want to see. For instance, if you are applying for a customer service based role then the employer would be looking to see how well you communicate with customers, problem solve, deal with customer complaints, and so on. Look back over your work history at all of the roles that were customer facing and think about how you performed. Was there an instance where you solved an issue with a very angry customer? Did you come up with a great idea to improve customer service? Did you receive a promotion due to your customer service excellence? Have you ever been tasked with training new employees? Once you’ve answered the questions above you can now look to see how you can incorporate that into your employment history to help the employer see how well you performed and how easily those skills and ideas can be transferred over. Can I use numbers to explain my performance? If you are applying for a sales role then using numbers and revenue generated would be an essential part of showing an employer how well you’ve performed in the past. Writing a CV for a Sales Executive job with an Audi dealership would be a great example of how you would implement sales, revenue, targets met, and anything else you achieved during your time. How much of a difference will this make to my CV? If you are able to insert a few examples of how you performed like we’ve detailed above into your CV, you are going to add a huge amount of value to your application and stand a much better chance of getting an interview. An employer wants to not only see that you have the right skills and qualifications, but that you’ve performed well in your previous roles and have the stats to back that claim up. A CV that doesn’t provide any evidence, but makes lots of bold and cliché statements is not going to get very far.